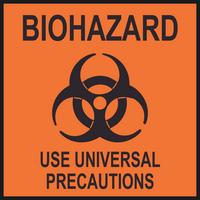 What are Universal Infection Control Precautions? Engineering controls refers to methods of isolating or removing hazards from the workplace. Examples of engineering controls include needleless injection systems, bacterial filters. Personal Protective Equipment (PPE) includes gloves, masks, aprons, and safety glasses. The purpose of PPE is to prevent blood and body fluids from reaching the first aider’s skin, mucous membranes, or personal clothing. PPE must create an effective barrier between the exposed first aider and any blood or other body fluids. When using a defibrillator, how do you know where to place the pads?